At least, it isn't one just yet. 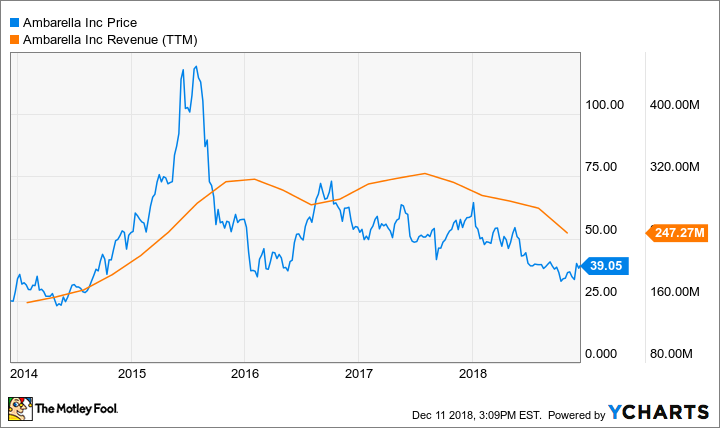 Shares of vision-chip maker Ambarella (NASDAQ:AMBA) got a small reprieve from this year's steep declines after the company's fiscal third-quarter report, issued on Nov. 29. Ambarella stock has climbed roughly 9% since the earnings report. Investor hopes have rested on the company's upcoming computer vision (CV) technology, and management reported that Ambarella expects to make its first shipment of CV chips by the end of the quarter ending Jan. 31, 2019. Ambarella's new tech represents a leap forward for artificial intelligence (AI) in its use in autonomous vehicles, driver-assist features, security cameras, and other applications. But the company isn't out of the woods yet. Personally, I'll need more information before boarding the Ambarella train again. During a surge in popularity of action cameras like GoPro a few years ago, Ambarella benefited as the chipmaker that powered high-definition video-capture capabilities. Ambarella wasn't a one-trick pony, as it also caught the wave created by the consumer drone industry. Both of those consumer markets proved to be short-lived fads, though, and Ambarella has been forced to find more stable revenue streams in industrial markets. It's found replacements in the security-camera and surveillance industry, as well as the automotive industry. Nevertheless, the process has been painful, as consumer sales, once comprising the majority of company revenue, have steadily deteriorated -- representing less than 15% of total sales in the third quarter of fiscal 2018. CV chips could turn the tide, pushing the company back into growth mode rather than its current replace-what's-been-lost regimen. CV chips help enable things like facial recognition in the security marketplace and are being evaluated as potential components in advanced driver-assist systems (ADAS) by automakers and their suppliers. Ambarella's first shipment of CV-enabled microchips during the fourth quarter is going to a security-camera maker, with the end product due for release around the middle of 2019. As for use in the auto industry, management relays that it's scored a few design wins for use in ADAS systems as well. However, as exciting as it sounds, it's hard to get too optimistic about Ambarella quite yet. While security cameras -- now the chipmaker's largest segment -- should get a contribution from CV as early as next year, it's still a year or two before sales to the auto industry make any material contribution. That's according to a rough timeline provided by CEO Fermi Wang, when asked on Ambarella's third-quarter conference call when investors should expect CV sales to become meaningful. As yet, we are not going to guide out, but I think [the consumer legacy business will] definitely be lower. That market will continue to decline for us. We're not putting any of our investment resource[s] in it [or] any of our focus on it. So I think the tail on that, it goes for several years, but it definitely will be declining over that period of time. As a result, Ambarella is likely to be stuck in decline for at least a couple of more quarters. Management guided for as much with its fourth-quarter outlook, informing investors to expect revenue to fall to $51 million (plus or minus 3%) from $70.6 million a year ago. That's another 28% drop on top of what's already been a bad run of luck since 2015. In short, with a poor immediate outlook and low visibility into the contribution of CV chips in the years ahead, I think it's still too early to call Ambarella's stock a buy. Wall Street seemed unfazed after the third quarter, but there could be a reversion to reality, once investors realize the company's transformation into a CV-focused operation will be several years in the making.